Capcom, Expert ès Beat them Up! 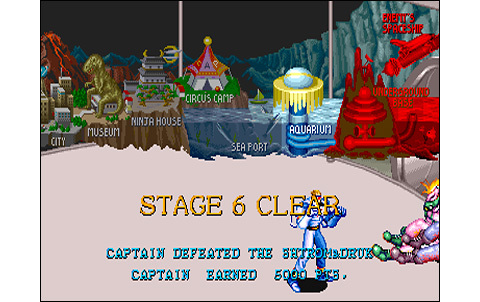 Any arcade lover or fan of Beat them Up is aware of how well Capcom did in this area. 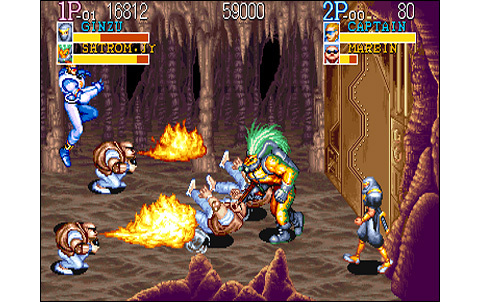 The firm, with the success of Final Fight and the great basics of gameplay and aesthetics of it, keep the good titles coming with The King of Dragons and Knights of the Round, two titles released in 1991 declining the genre in the medieval-fantasy style. 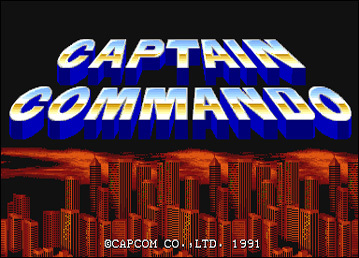 It's a few months later the same year that Captain Commando is released in the arcades, and the action in this one is a little more futuristic, because it takes place in 2026. Oh yeah, when you were talking about 2026 back in the early nineties, we could imagine a great technological world, man walking on Mars, there would be robots, flying cars and everything, but all these were in our minds before the advent of international fart competitions, Double-U as a president, Disney Star Wars, the japanese TV games and Pokémon GO. Since then, the priorities of humanity have changed. So don't ask me why and just try to imagine the future that could have dreamed of a kid born in the seventies, before the human race flipped into the world of Idiocracy. 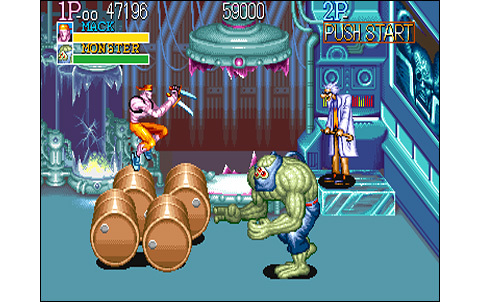 True to its habits, Capcom offers the player to choose from several characters, here there are four available. 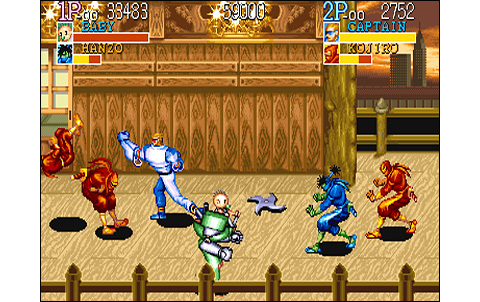 A baby in command of a robot, a bandaged mummy wielding knives like no other, a ninja armed with a katana, and of course Captain Commando, the muscular blond hero, perfect son-in-law, recurring in the fighting games. 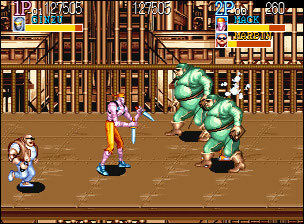 Let's talk about the scenario, as we are back in Metro City, forty years after Final Fight. 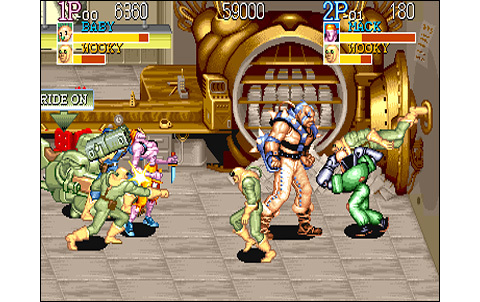 Haggar eats dandelions by the root, while Cody and Guy are in retirement homes since a long time now. And so it's again the brothel in this city decidedly subject to the worst vices and debauchery. Crime has become uncontrollable, as a form of 'super-crime' has spread to the whole world. These are hordes of malicious individuals with superpowers and extraordinary abilities. 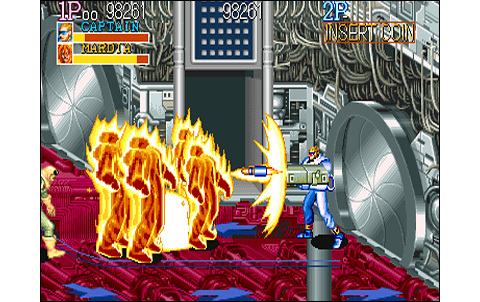 All are subordinated to Scumocide, the big extraterrestrial Boss who provides them these famous powers. 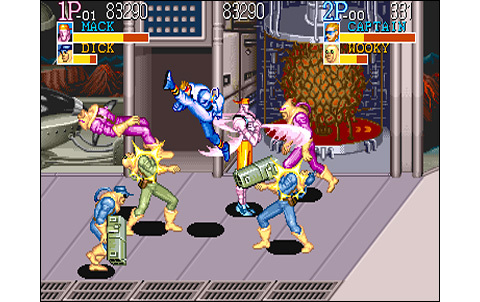 Captain Commando and his weird pals have decided to rid the planet of this international clique, which is everywhere at home. Nine stages, this is not trivial and our game will not disappoint the pixel-art lovers about the variety of environments. City, museum, house of the ninjas, circus, underwater complex, aquarium, base of the villains like in a James Bond movie, space rocket, and finally another planet. They must have had a pretty good coke at that time at Capcom's. Even the enemy bestiary is diverse, with a dozen of different energumen. 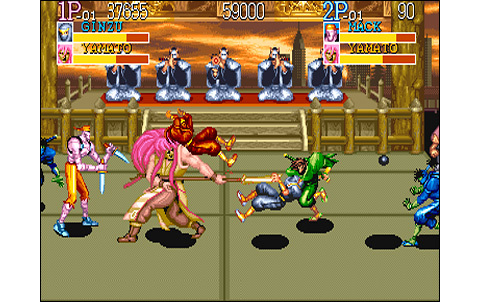 Bosses are not bad either, but much less impressive than those of Mutation Nation or Sengoku 2, for example. Sprites are not huge, but it's no worse: when you play two, three or four, the action is only clearer (and it's not luxury). 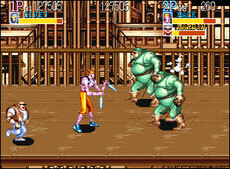 The gameplay is impeccable, like most Beat them Up that were made by Capcom. 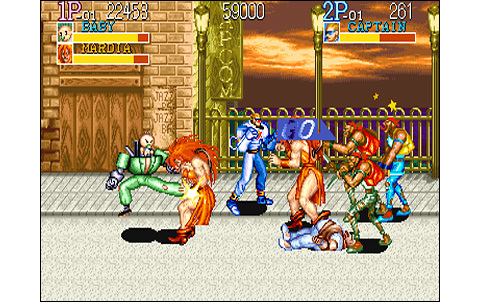 Only two buttons are used (kick and jump), but our characters have combos, two or three jumped attacks, wrestling throws, and it's also possible to run and carry running attacks. Weapons of all kinds will be on your way (rocket launcher, pistol, mass, machine gun, pistol-laser, etc ... and also different robots on which you can climb. The soundtrack is a little dull, but improved by very good sound effects which the company has the secret. The impacts of blows and other sounds are excellent. 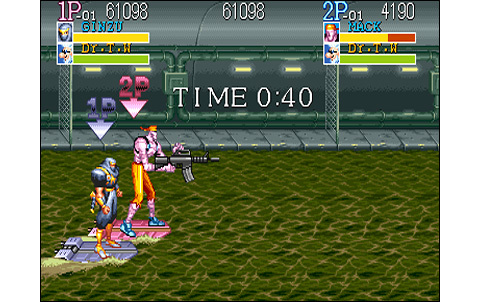 CC is not easy to clear, but the CPU is still less punitive than in SNK games, for example: with the exception of some Bosses, real credit whores (understand who cans), the difficulty is quite balanced and not too repulsive. 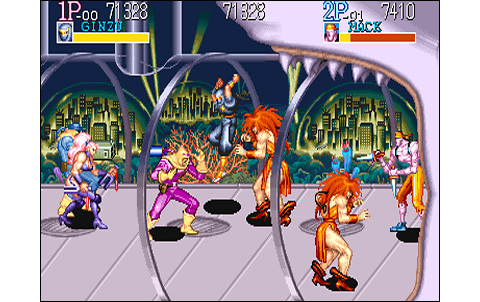 The characters are atypical and play differently from each other, which gives as many excuses to go back to the game once completed. 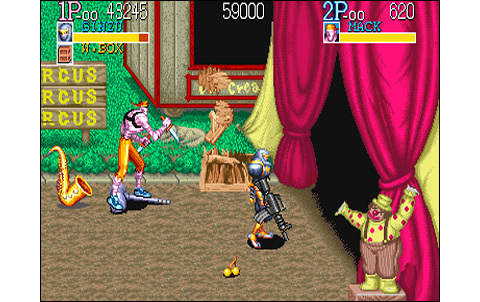 The stage in Hoverboard (the third or fourth, I don't remember) is very fun and comes to break the monotony, just like bonus stages in other games. And then the futuristic-glaucous atmosphere of this game is very nice, a bit in the spirit of Mutation Nation or Undercover Cops. 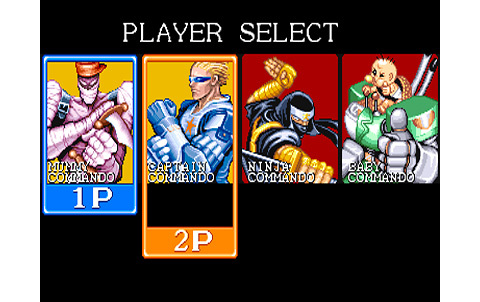 Captain Commando may not be Capcom's best BTU, but it's certainly in the lead pack, so I recommend it warmly to all aficionados. Nine varied stages in the "comic" spirit, finely drawn but not too detailed. Characters are small but very well drawn. The global quality is nothing special, but the melodies fit well the action and noises and voices are exactly what we're waiting for in a fighting game. 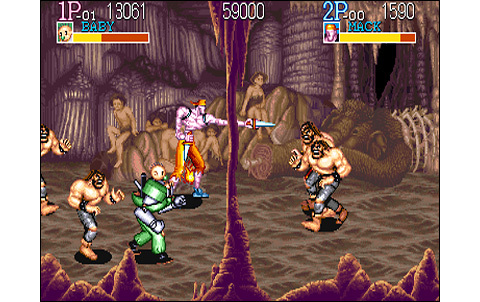 The game is pretty long for a Beat them Up, the enemy bestiary wide, and the difficulty is gradual. 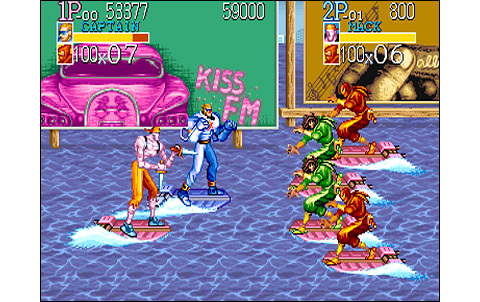 The fact to play four simultaneously is nice, but it's often messy and just ok to have some fun: no scoring or serious play this way. 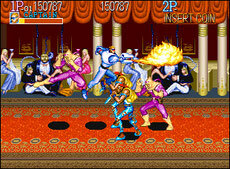 The four heroes have a wide range of moves and throws, plus the weapons you can pick up and robots you can use. 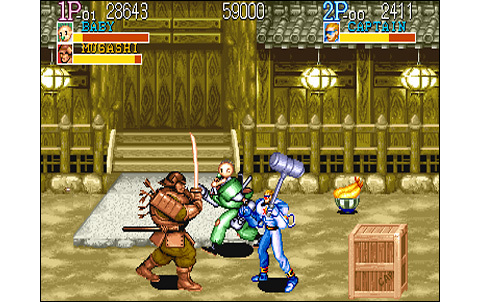 It's smooth and the collision tests are accurate: it's a Capcom game, for sure! 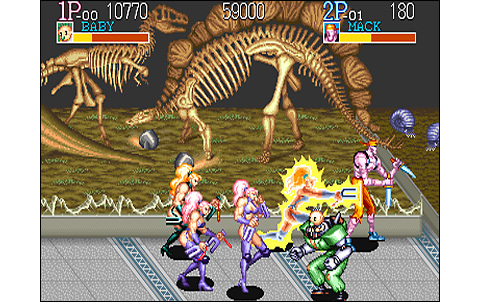 A gorgeous Beat them Up, which has all the ingredients required for the amateurs of this type of game. 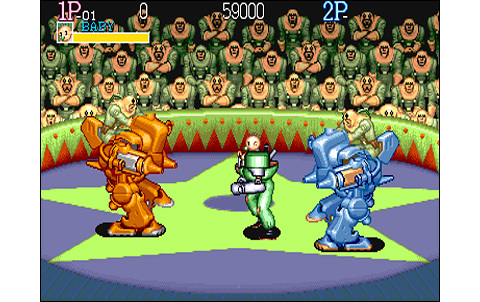 Mutation Nation and Robo Army were released at the same time and look very similar to Captain Commando, as they also occur in a futuristic world and use almost the same game mechanics. However they can only be played two simultaneously are a just a bit less good than our game here.